MLStrand56 asked the Answer Line about something that should be easy: How do you delete an email address in Gmail? Gmail remembers two different types of addresses. First, and most obvious, are your contacts--the people, companies, and organizations that you have intentionally added to your address book. The other addresses are those that you've sent email to but never entered as a contact. In many ways, this is a nice convenience. You've never bothered to add this person to your contacts, but you can still start typing their name or address and up comes the right selection. But it can also be a problem. You start typing in a friend's name and up come two addresses--the one from your contact list and a dead one you haven't intentionally used in years. And you pick the wrong one. 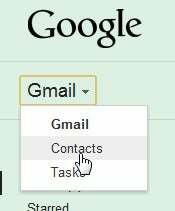 Click Gmail in the upper-left corner of the Gmail Web page, then Contacts from the pull-down menu. Start typing the name or address in the search field. When the unwanted address appears, select it. This will bring up the page where you can turn this person into a real contact. You can add or change the name, address, a birthday, and even a photo. But that's not what you're here for. Instead, pull down the More menu near the top of the window and select Delete contact. It's possible that if you start typing the name into a message's To field immediately, it will still come up. But if you wait a couple of minutes, it won't. And it won't ever again. There is one variant to this: When you select the name, you might find that the unwanted address is one of several for a real contact whom you want to keep. You just want to get rid of that particular address. 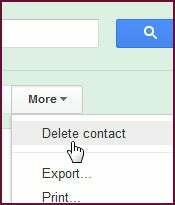 In that case, don't select Delete Contact. Just click inside the unwanted address field, press CTRL-a to select the entire address, then press DELETE.